This month we are all batty about birds! Taking a look again at an illustration, archival item and a book to explore three very different elements of our collection. 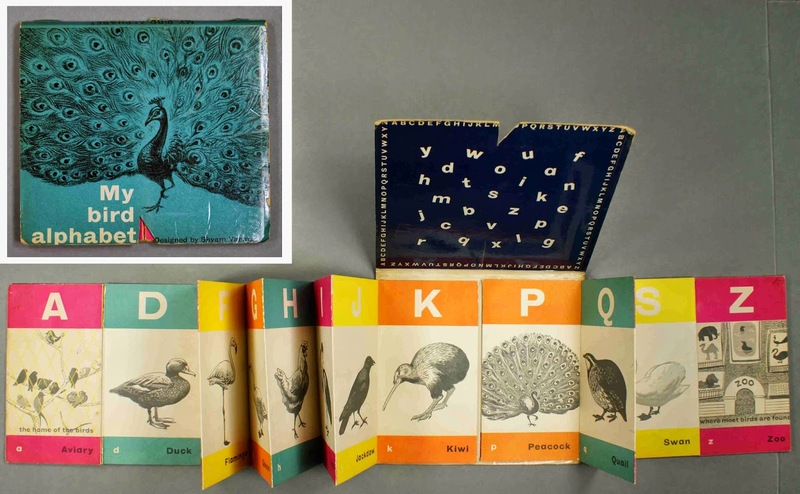 This month’s book is My bird alphabet, designed by Shyam Varma and published by Hutchinson & Co. Ltd in 1960. This is one of several ‘Bird’ themed alphabet books to be found in ‘Pat Garrett’s ABC collection’ and is a good example of the sort of non-standard format books we hold. The pages in this book concertina in/out from either side. Most pages include an illustration of a named bird, and in common with many ABC books, the appropriate initial letter is given in both upper and lower case fonts. Some birds are very familiar (Duck and Hen) while others are probably less so - Ibis, Quail and even Xema! In the photo above you will see an interesting interpretation of the letters ‘A’ and ‘Z’: ‘A’ is for Aviary "the home of the birds"; while ‘Z’ is for Zoo "where most birds are found". Pat Garrett has been kindly donating duplicate copies of titles in her ABC book collection (as well as an extensive collection of Counting & Number books) to Seven Stories since 2008. So far we have received 585 ABC books (mostly published between the 1930s and 2010), but this collection is still growing. Whilst this collection consists predominantly of picture books, it also includes board books, cloth & bath books, friezes, and even activity books. 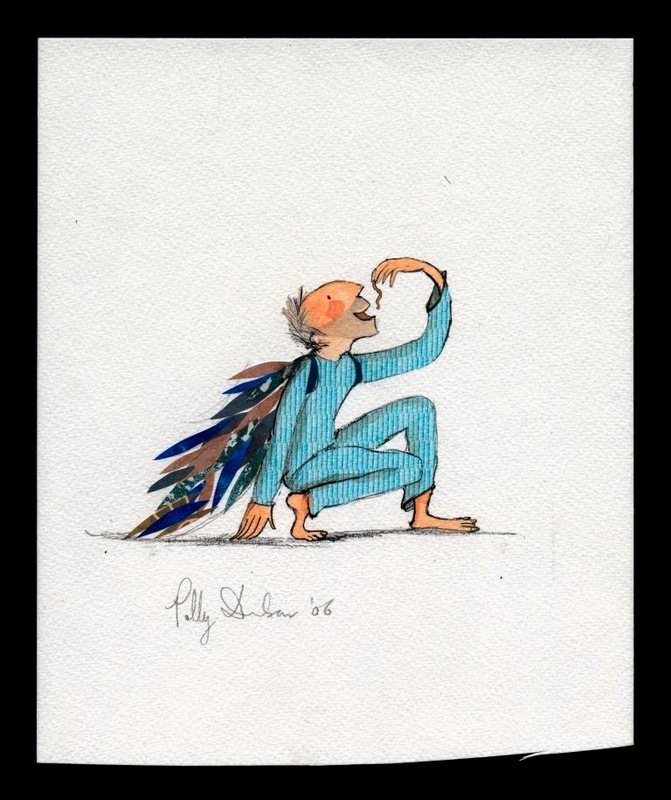 This month's artwork was created by Polly Dunbar, for David Almond's My Dad's a Birdman. Donated alongside Almond's early notes, playscripts and drafts of the text, this suite of illustrations represents a fascinating view into the creation of a book. The compelling story and ability to see both sides of the development process - the archive also includes Dunbar's preliminary sketches - means this is one of the most utilised archives with our Learning and Participation team. To see more of this archive, click here. Dunbar donated the full suite of artwork and preliminary sketches for My Dad's a Birdman in December 2008, following Seven Stories purchase of two of the finished pieces of artwork in October of that year. Since then, we have also been happy to receive some more illustrated birds by Polly Dunbar, she contributed an illustration for 'Sing a Song of Sixpence' and 'I Had a Little Nut Tree' to the nursery rhymes anthology Over the Hills and Far Away. The final section of our monthly blog post is all about possibly the most famous birds of the children's book world - Puffins! One of the first major acquisitions by Seven Stories, in 1997, was the archive of the long term Editor-in-Chief of Puffin, Kaye Webb. It is a vast archive, with purchase being made possible with support from the Heritage Lottery Fund and Friends of the National Libraries. The archive covers Webb's career, with a huge amount on her almost 20 years with Puffin, correspondence between large numbers of authors and illustrators, diaries, scrapbooks, and thousands of books and ephemera. 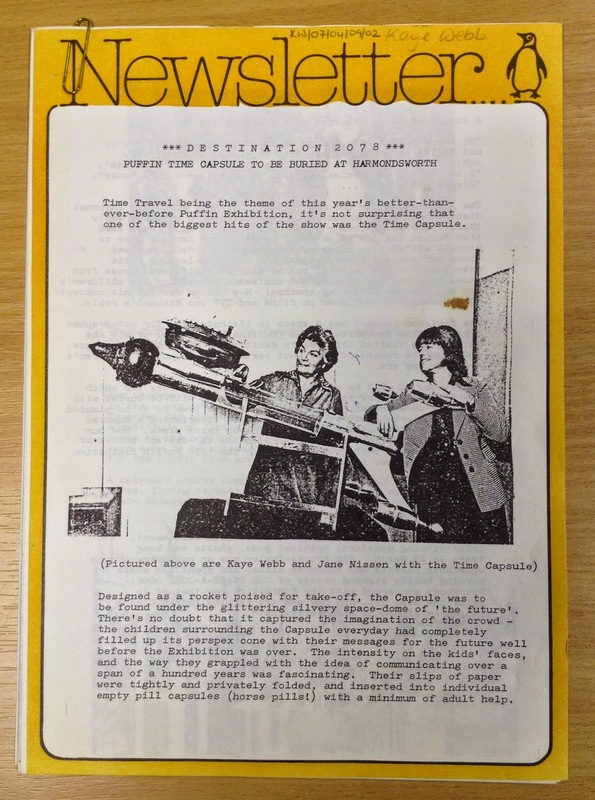 Within the archive can also be found details of a great experiment, the creation and burial of the Puffin Time Capsule. Eagle eyed visitors to the Ouseburn visitor centre will remember that this time capsule is actually buried within the foundations of Seven Stories! The archive reveals more, detailing the messages from various Puffin authors, as well as Webb herself. The capsule was buried in August 1978 at the Puffin offices in London. When Puffin moved, it coincided wonderfully with the creation of Seven Stories, which was thought a very appropriate new guardian of the capsule. The capsule is due to be uncovered in 2078, by which time we will find out if the specialist preservation techniques used on the books have been a success! To find out more about the guardians, visit their website here.